Join our 3 year anniversary Doodle Party! Covered in blank paper, our front gallery walls are open for visitors to contribute their words, scrawls, comics, cartoons and doodles! At the end of November, this sheet will be removed and cut into Volume 2, Issue 2 SPF'17 Doodle Zine. SPF'17 will be the second annual Small Press Fair organized by Girls' Club and IS Projects. This fair is an opportunity for the regional print-making, book-making and zine-making community to share ideas and showcase new work for one special day in Fort Lauderdale. 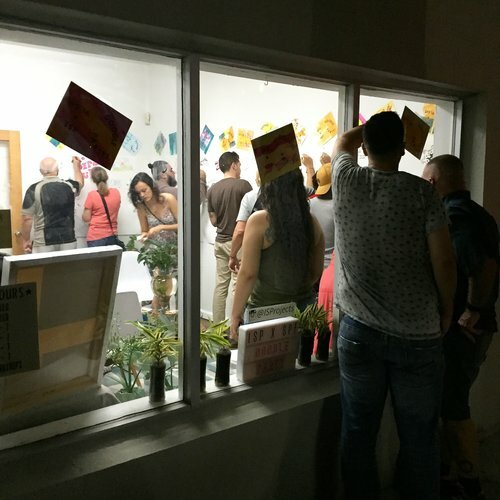 SPF is made up of a market of over 50 exhibitors of prints, books, zines and everything in between with events such as steamroller printing, live demos, hands-on workshop, and a stage for the exploration and discussion of the print/book/zine sub-culture in South Florida.